BIRMINGHAM, Ala. - Chris Lane's dream of winning the 2014 GEICO Bassmaster Classic is different than the dreams of the other 55 anglers in the game. As the 2012 Classic champ, Lane knows that to be true. Yet this time around would be different. In 2014 - his fourth Classic - he's not only a competitor, he's the hometown entry. Friends, neighbors and fans in his adopted hometown of Guntersville are looking to Lane to take a second Classic title - this time for them. Fans everywhere assume he has a home-water advantage and expect more of him. "There's added pressure when it comes to fulfilling the expectations people have of you because you're fishing at home," Lane said. "I think my biggest challenge will be time management, using my time each evening preparing for the next day's competition. It's hard to put everything else aside when you're at home." Recognizing what's ahead of him, Lane set to work as soon as he nailed a Classic qualification by winning the final Bassmaster Elite Series event of the 2013 season. His mission: Sew up a gaping hole in his lake knowledge. "In the five years I've lived here, I haven't fished the lake much from December to March because I've had other things scheduled," he said. "I knew I needed to learn a lot to give myself a chance to do well." "I could just takeoff from my own dock, get back for lunch with my kids and be home every night," he said. "I was able to put in a lot of time on the water right up until cutoff on Dec. 31." "The lake has a lot of big fish," Lane said. "The 30-plus-pound bags are here." By February, the lake's bass will have been feeding to get in shape for the spawn, and they'll be as fat as they'll get all year, Lane said. That means a limit of five big bass a day will be needed to top the leaderboard, he said, and the game could easily change from one day to the next. "Anyone could come from behind with a huge sack and take over," Lane said. "This will be a Classic that's a nail-biter to the very end." Lane made his predictions with a disclaimer: "Weather permitting. Water clarity will be a big factor in the weights." 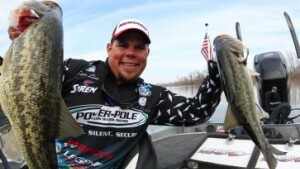 Lane wants to be that angler: "It was so sweet to win a first Classic. Winning this one would be just as sweet, being at home."